There are several ways you can travel from Thailand to Cambodia some of which are easier and safer than others. For one, you could choose to use road transport or a combination of road and rail or you could simply hop on a plane. I've been to Cambodia twice. Once by road, crossing the Thai/Cambodia border at Poipet and another time taking a flight from Bangkok to Phnom Penh. Given the close proximity between these diverse countries, I'm not quite sure why more tourists visiting Thailand don't take the opportunity to visit Cambodia. It simply amazes me. I'd have thought more tourists would visit the country. Don't get me wrong, I believe that there are plenty of backpackers travelling to Cambodia, especially by those living in Bangkok's Khao San Road, which some of you may know is a district known for its cheap hostels, cheap restaurants, cheap bars cheap paraphernalia and cheap hookers. (If that's what floats your boat) But for the purpose of this exercise, I'll tell you how I went about my travel arrangements. A comprehensive introduction to Cambodia by air as seen in the tour details above will take you to sites that reveal the country's tragic recent history and the inspiring UNESCO World Heritage-listed Angkor temples. The knowledgeable guide on this tour will enlighten you about the Khmer Rouge of Pol Pot’s regime at the Tuol Sleng Genocide Museum and the Choeung Ek Memorial, site of the infamous Killing Fields. After that youll travel by air from lively Phnom Penh to the French-colonial city of Siem Reap, where you get to see Bayon, Ta Prohm and Angkor Wat with your three day Angkor Pass. Numbers are limited to 16 people, ensuring a personalized experience with a small group. Depending on whether you wish to visit the ancient Hindu temple of Angkor Wat near the town of Siem Reap or the killing fields near the city of Phnom Penh, my suggestion is to check all travel and tour alternatives before making a decision. That way there is less chance of you getting scammed by unscrupulous booking agencies. That said, there are legitimate tour companies that do provide sound advice for a relatively safe and hassle free journey between the two countries. You have to bear in mind that being in a foreign country, it's not easy to know where to go or who the right people are to talk to. It's simply the nature of the beast. Also stepping out of your comfort zone into the unknown can sometimes be trying. But if you take a deep breath, hold your head up high and use good judgement, you'll be okay. For this exercise, I'm excluding the Khao San Road version. Before I tell you about how I went about organising my road trip from Thailand to Cambodia, I want to say that it was the best travel decision I've ever made. And if anyone should ask me what the most memorable moment was on any of my journeys around the world, I'd have to say it was my four hour road trip from Poipet to Siem Reap. Now just so you know I'm done and dusted with the whole backpacker thing. I did that years ago, so this time I went about my business in a more grandiose way. By that I mean I decided to book an all inclusive private tour. I was in Pattaya at the time and found a reputable tour company on Second Road who arranged the whole package for me. First of all, you would need to hold a passport that has a validity of at least six months before the expiry date in order to enter Cambodia. But that's pretty mandatory no matter where you go. As far as the visa goes, the vast majority of visitors entering Cambodia need a tourist visa which is easy to obtain and more so at the two international airports. One is in Phnom Penh and the other is in Siem Reap. A typical visa is valid for 30 days, however, you can also get a three-month visa too. Now you may find this somewhat of interest. For my organised road trip in Cambodia, I received a three-month visa which was arranged for me via the tour company. The visa was placed into my passport, not at custom in Cambodia, but by Thai officials at the Thai/Cambodian border while I was still in Thailand. Even I found that rather strange. The visa was prepaid along with all my transport to and from Pattaya, all my hotel bookings, private tours and most meals too. The cost of the three-month visa was 1,900 Baht. A one month visa issued at Phnom Penh airport was $25. I'm also told that you can apply for a visa online via a Cambodian Embassy or on arrival at any of the international airports or some land crossings. Visa extensions are also possible. Just be aware that if you are arriving at the capital by an airline carrier, you must pay for your visa in American dollars. Officials there do not accept Cambodian Riel, their local currency. At the time of writing the Cambodian currency is practically worthless and one American dollar will buy you approximately 4,000 Riel. Most hotels and restaurants only accept American dollars. Sadly the fall of the currency came about during that terrible reign of Pol Pot and his Khmer Rouge thugs. Not only would you be going on a trip of a lifetime, but you'd be supporting the locals with a true act of kindness. It was at the end of the rainy season when I entered Cambodia via the border crossing at Poipet with my then Thai girlfriend. It was total chaos, but somehow it had a beauty and atmosphere beyond imagination. You go rapidly from a tarred road in Thailand to a gravel road in Cambodia. But what a fantastic way to begin our road trip. Once there we waited for our transport to arrive which eventually came in the form of a Toyota Camry courtesy of a third, fourth or fifth generation Thai car company sale. Most cars in Cambodia are sold once their sell-by-date in Thailand has expired. Nevertheless, it was a fairly comfortable ride notwithstanding the thousands of potholes that jar you to the bones. Don't concern yourself too much with all the chaotic confusion while waiting for your transport to arrive. It may not appear organised but somehow everything falls perfectly into place. Just relax and let the events unfold naturally if that makes any sense at all. After all, you simply cannot change the system. And even if you could, the sheer character of the place would be lost forever. Somehow it just wouldn't feel right. Some places need to be left as they are for that's exactly what inspires all those fortunate enough to journey to places like this. Apart from the border crossing at Poipet there's another crossing at the Chong Chom border 72 kilometres (43 miles) south of Surin on highway 214. I haven't used this crossing to go from Thailand to Cambodia but if you are in the region, you may want to give it a try. If you use this crossing, you must visit the ancient Hindu temple of Preah Vihear built during the reign of the Khmer Empire. The temple is located 160 kilometres (100 miles) east of the crossing and it sits on top of a 525 metre (1,722 foot) cliff in the Dângrêk Mountains. Now Siem Reap may be approximately 160 kilometres (100 miles) from the border at Poipet and what would have been a leisurely two-hour drive on a normal tarred highway, took double that time on gravel. I also don't think it's a good idea to eat a solid meal before this road trip as you just might find that by the time the journey is all but over, you just might find your meal has been completely liquidised. The entire journey is on gravel ground. But the interesting thing is that I found this particular road trip fascinating, not only for the fact that along the way we hit pothole after pothole, (Some deeper than others) the landscape along the route is truly remarkable. While the road may be home to a diverse assemblage of traffic, including trucks, cars, bicycles, motorcycles and water buffaloes, everywhere you look, whether left or right, has an absolute serenity about it. It's unbelievable to think that only a few decades ago Cambodia was plagued by unrelenting adversity, unimaginable torture and starvation beyond belief. All this because of three fanatical men who were hell-bent on absolute power and excessive greed. There's no denying that Nixon, Kissinger and Pol Pot caused insurmountable misery through their combined heinous crimes. It's regrettable and could have been avoided. Whatever remnants of past atrocities there are, the Cambodian people have been remarkably resilient in their recovery. Wrongdoings aside, we were not going down memory lane this awe-inspiring day in Cambodia. This new day as our bodies were repeatedly getting pounded, (at no extra cost) we took in all the sights and sounds of rural Cambodia. Because before we finally reached Siem Reap, that's exactly what we got. Maybe it might not seem like much, but on the contrary, it was amazing to see emerald green rice fields after emerald green rice fields, white clotted sky and miles and miles of heavenly nothingness. That is of course apart from the hundreds of made-for-sale stalls we saw along the route and where local Cambodians go about their daily chores selling petrol from recycled soft drink bottles. Then on a small scale, there were a few antiquated dusty brown villages that passed us by and the odd gas station where we stopped to stretch our legs. Just before dusk, we arrived in this beautiful little french colonial town called Siem Reap and the Monoreach Angkor Hotel which was to become our home for the next few days. The hotel is just an eight-minute taxi ride from the airport, a ten-minute taxi ride from the Angkor Wat Complex and a two minute Tuk Tuk ride into town. 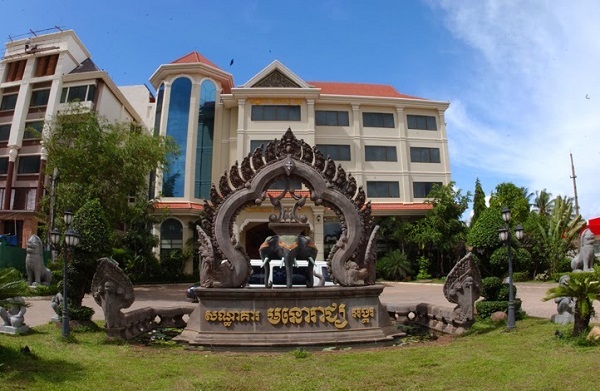 Monoreach Angkor is a 4-Star hotel located on National Road No. 6. It's also the airport road as you come into town. The whole road is overflowing with one hotel after another. We were there in the beginning of October and there wasn't another tourist at the hotel during our stay. We had the place to ourselves and couldn't believe it. The hotel comprises of 110 deluxe and standard rooms and suites, all with air-conditioning, TV, international direct dialling, both shower and bathtub, a mini bar and superb views overlooking the town or pool. We had a pool view from our room. I cannot fault this hotel for service and in our case, individual attention. The only downside was a lack of goodies to eat at breakfast, especially for vegetarian people like me. Perhaps the no-show at breakfast was due to the lack of tourists. My Thai girlfriend and I had the swimming pool to ourselves, the fitness room to ourselves, the elegant bar to ourselves, the restaurant to ourselves, the games room to ourselves. In short, we were treated like a king and queen. I'm not sure if you'll get the same attention as we got because back in 2006 when we were there, the hotel was only two years old. I believe that most, if not all the hotels in Siem Reap are financed by Japanese investors. Surely that year was a huge loss. Part of our tour was a trip to Tonlé Sap Lake which I'm told is the largest freshwater lake in South East Asia. Depending on what time of the year you visit, the lake expands and then shrinks dramatically with the various changes in seasons. We were there in October and the lake was at its fullest due to the heavy rains that began in June. But if you should be here during the dry season between November and May, you may not get the chance to take a boat ride on the lake. I would have to say that the best time to visit is between September and October, simply because this is the end of the rainy season and chances are, the weather will be perfect. The boat ride on the Tonlé Sap Lake was a real treat as we got to see how the locals (many of whom were Vietnamese fishermen) go about their daily lives. Tonlé Sap is home to several fish and bird species. And believe it or not, the lake also holds the world’s largest population of freshwater snakes and a significant number of Siamese crocodiles. While we did not see any snakes, we did see a fair number of crocodiles. Thankfully not on the lake itself, but on one of the floating barges. The lake also supports several floating homes, a floating restaurant, a floating school and even a floating playground for kids to partake in a number of different sports activities. 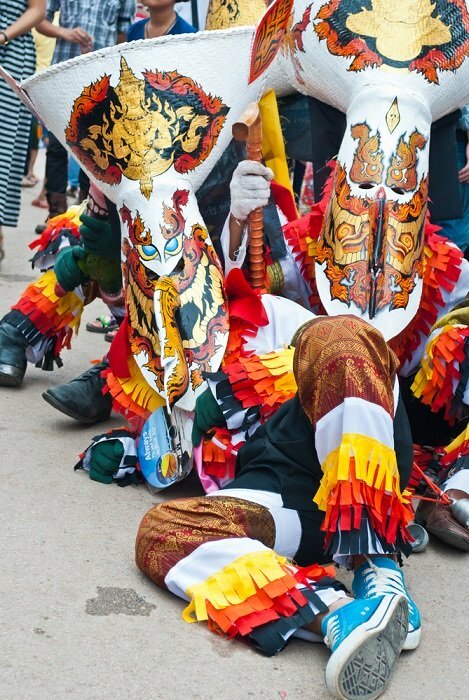 In summary, this region is a wonderful introduction into Cambodian culture. I strongly suggest that should you be here, you take the opportunity to stroll along the shores of Tonlé Sap Lake. And while you're at it, don't be afraid to strike up a conversation with some of the locals. You'll be surprised how easy it is and just how open-minded and accommodating these friendly folk are. I found it fascinating chatting to some of these incredible humble people. I was even granted permission to enter one the wooden homes (built on stilts) so that I could get a clear picture of how Asian cultures live, work and play. I got to see how a Cambodian family live in a one-room home with an attached kitchen area. What I did notice was a car battery in the living room used for lighting but there was no bathroom. No matter what some tourists think about embarking on a trip from Thailand to Cambodia it will be more than a life changing experience. 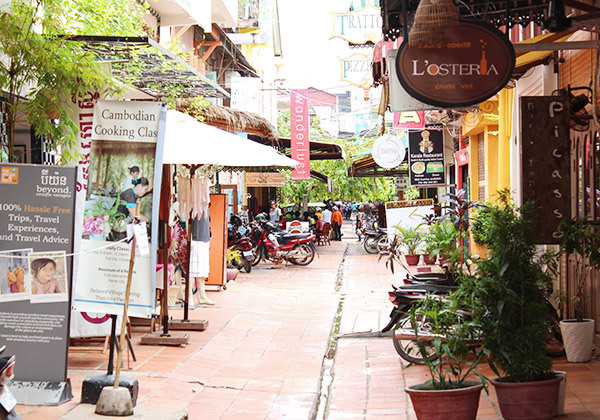 And the few days and nights you might want to spend in Siem Reap is especially no exception. It may not have the same exacting standards as the cities in neighbouring countries, but it does have a unique and historical charm like no other. I for one love it here. Strolling around the quaint and quirky streets was a real treat and the Cambodian people who irk out a modest living, are remarkably friendly. It all began with a short Tuk Tuk ride from the Monoreach Angkor Hotel into town at a cost of just $1. Tuk Tuks here are not quite the same as those in Thailand, but that was to be expected. The distance from the hotel to Siem Reap was so short that we could easily have walked, but trying to escape the gauntlet of local cab drivers is a risky business and simply cannot be ignored. Nevertheless, it proved to be the best way to get around. Siem Reap may not be so much a big bustling city, but it does have an unforgettable personality and aura all of its own. The streets are abuzz with activity and the shops are an absolute delight. Walk down any narrow side street and you'll find a whole host of interesting things you won't see anywhere else. Take the sandwich board I saw outside a small restaurant advertising cooked meals made from crocodile, giraffe, snake, frog and other exotic animal meat. Our German friend couldn't resist the temptation to sample some of the crocodile and snakes on offer. Being a vegetarian, I opted to observe rather than to participate in this local feasting frenzy. All said and done, the crocodile and snake I was told, tasted just like chicken. What I liked most (well almost) about Siem Reap was the bookshops, most of whom sold books with photocopied pages that were hurriedly bound together. Nonetheless, the books were priceless, even though many were sold for a dollar or two at the most. Also, the books sold here simply cannot be found anywhere else in the world. And as cheap as they were I was more than happy to spend my money where it mattered most. In fact, I almost felt guilty paying the prices quoted. At one stage while admiring the beauty of city life I was approached by a middle-aged woman who tapped me lightly on the shoulder and then held out her shabby hat. She didn't as much as utter a word before I placed some money there. I had to admit I was really saddened by what is still fairly prevalent in this country after all that had happened there in recent history. The memories I felt there will always hold a special place in my heart. But before I wished the humble lady on her way, I was surrounded by several youngsters asking if they too could have some cash. What really surprised me was how young these kids were and when on closer inspection, I noticed some of them had missing limbs. While inequity remains a reality throughout the country, Cambodia will always be one of the most awe-inspiring places I have ever visited. 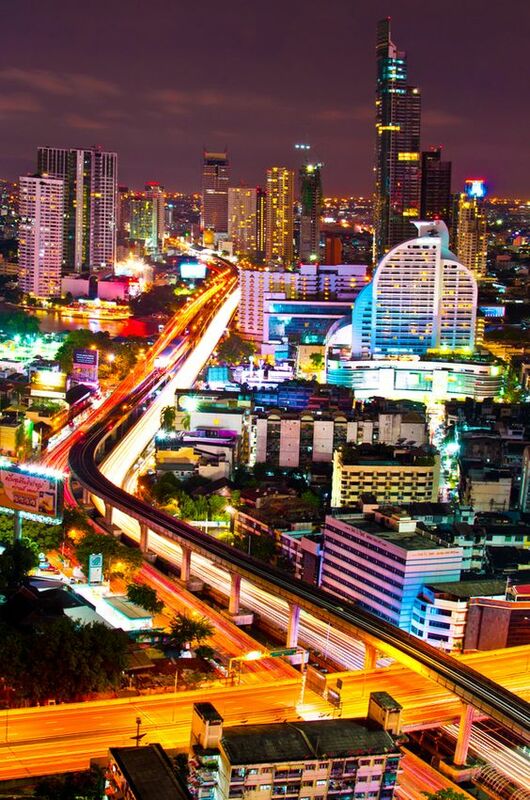 And while Thailand may be the ultimate pleasure destination in South East Asia I urge you all to step out of your comfort zone and go see the real beauty of a great nation often forgotten but clearly not lost. The next day after breakfast we set off to see the ancient temple ruins of Angkor Wat. It's possibly the most visited site in all of Cambodia and what a majestic presence it is when you first set eyes on it. Not only is the temple immense but it's pretty impressive too. 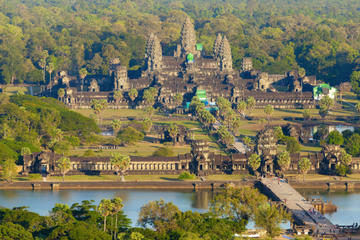 Just so you know Angkor Wat was originally a Hindu temple built in 1181 but today it's a Buddhist temple. It's also the world's largest religious structure. The entrance fee, which was about $45 was included in our tour, and it came with a local guide. Though the guide was pleasant and friendly we could easily have done without him. He talked a bit too much and at times became somewhat tiring. Please don't tell him I said that. These tour guides mean well, but you may prefer to just go it alone. Depending on how much time you want to spend roaming around the massive temple grounds, make sure you take plenty of water with you as it could be while before you find any of the locals selling refreshments. It can get pretty hot wandering in and around and up and down the temple. Be prepared for at least half a day sightseeing. After a good few hours checking out most of the sights of Angkor Wat, I desperately needed to spend a bit more time chatting to the locals. Surprisingly enough, I found several locals who were only too happy to engage in conversation. Mostly because they want to sell me everything from their local crafts to their pirated paraphernalia. If you've spent time in the country as I have, you'll soon become aware of the despair that's still hanging heavy almost everywhere you go. Don't dwell on it too much, but what you can do is help out in any way you can, even if it means purchasing pirated DVD movies, music and anything else you can lay your hands on. Unlike home, here in Cambodia, it all goes to a very good cause. One of the things I just had to buy was a pirated copy of a movie called City of Ghosts which, as it happened, turned out to be one of the best movies I have ever seen. The movie, City of Ghosts is a drama co-written, directed and produced by Matt Dillion. He also plays the main character in the movie, that of a con artist who's been swindled out of his share of the money from a business partner in an insurance scam. The movie takes you from New York to Bangkok and then on to Phnom Penh in Cambodia. On a separate note, but not entirely out of place, it certainly wouldn't hurt to open your heart and extend a helping hand by donating any spare cash you might have to make the lives of these humble Cambodian locals that much more sustainable. Of all the countries I've had the pleasure touring, Cambodia really hit a soft spot in my heart. Because of this, I'm also trying to do my bit to extend a helping hand where I can. Only in a much more intrepid and audacious manner. What I mean by this is simply to help raise funds to provide Cambodian youngsters who have lost a limb due to land mines left behind by the late Khmer Rouge junta. I am currently involved in a campaign which I've named The Prostate for Prosthetic Project. The name of the campaign says it all. One of my tasks as a nutritional guidance counsellor (apart from being a travel writer) is to reach out to anyone who would like to know more about my teachings on how to make one of the easiest cancers in men, preventable. Yes, you've guessed it. It's the prostate. Basically what I'm proposing is the following.... If I am able to help you recover from your prostate predicament and you get to live a long and healthy life, I need your help in supporting one of my Children in Cambodia with a prosthetic so that he or she may also get to live a prosperous life. I am also happy to extend my support to women who suffer from breast cancer. Did you know that prostate and breast cancer are respectively the two most common cancers in men and women and are the easiest to cure naturally? If you'd like more information on how to prevent these cancers, just fill in your details on the contact form below. You can also view my new website www.healthtaboo.com﻿ for more information on health and nutritional issues should you want to learn more about the good stuff for a long and healthy lifestyle.